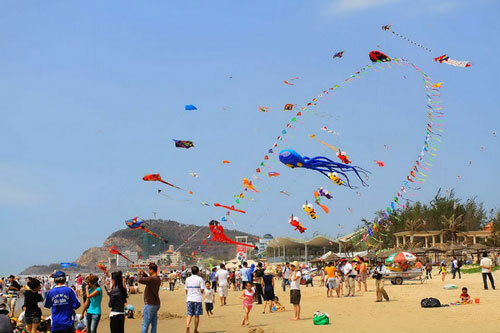 BA RIA-VUNG TAU (VNS) — Viet Nam's annual International Kite Festival opens today (April 22) in Ba Ria – Vung Tau Province's southern beach city of Vung Tau. This year's week-long festival, themed "Bay Cao Cung Viet Nam" (Flying with Viet Nam), has attracted about 100 kite artisans and connoisseurs from Germany, France, Italy, New Zealand, Australia and Viet Nam. Kites include a traditional six-sided Japanese fighter kite called Rokkaku, a Vietnamese kite with bamboo flutes, huge kites with shapes of human figures, and sport kites. There will be competitions in kite making and kite flying. A special night kite performance with sound and lights will also be held from 7 pm to 10 pm on April 25 at the Paradise Golf Club. Besides the kite festival, the province will host a Food Festival from April 23 – 26 at the Trung Trac – Trung Nhi Park with the participation of 34 local restaurants, hotels and handicraft villages. The event will highlight specialties from different regions of Viet Nam, especially seafood. Authentic dishes from countries like Malaysia, Thailand and Ukraine will also be offered.